One of the most interesting batteries of the entire Atlantikwall can be found on a rocky hill near the old Austråttborgen, a medieval mansion. Like its sister battery at Sotra (MKB Fjell) near Bergen, a shaft was cut out of the rocks for the huge former Gneisenau battle ship gun turret. The triple 28cm SK C/34 turret became available after the discontinuation of the Kriegsmarine battle ships building programme in 1942. Turm Anton was split up in three seperate barrels and placed in the MKB Rozenburg in Holland. Bruno was installed in a shaft on Sotra, at MKB Fjell. Turm Caesar found its way half way up Norway. About 650 Yugoslavian slave labors (former partisans) in total worked under awful conditions on the tunnels and bunkers around the hill. 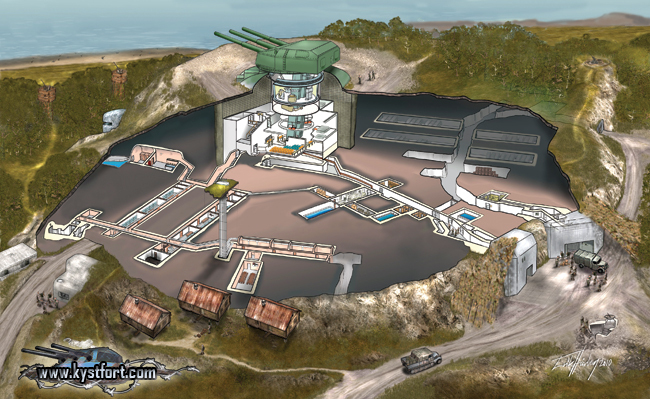 In a very short time a vast underground system with supporting bunkers around was finished. In August 1943 the guns test fired. No real engagements followed. Today, the underground barracks and turret shaft with its ammunition rooms are open to the public. Because the Norwegians kept the site in use until 1968, and took care of it until 1977 it stayed in a good state of preservation. Today it's about the most complete example of a heavy German coastal battery. Not only the gun turret is highly interesting. The site still has its infantery defences comprising of trenches, Tobruks and a recently renovated 4.7cm Festungspak 36 (t) in working condition. It covers an anti-tank wall through the woods which protects the entrance of the complex. Special thanks to the museum for the extra long tour and opening up the S 446! A great cross section of the complex by Erik Hårberg. 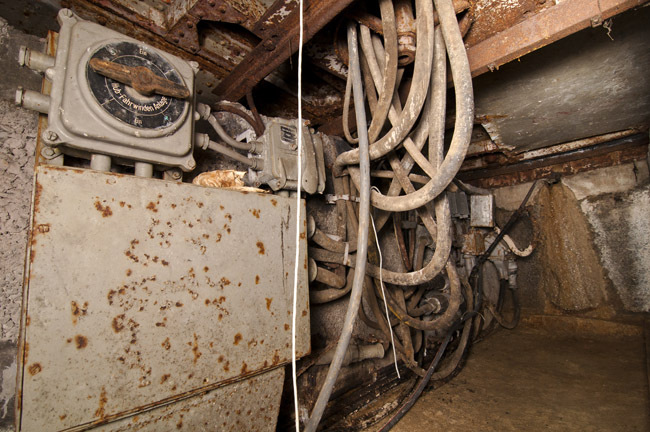 You won't get closer to the core: cable room beneath the gun turret.